Be it personal or home use, Dettol meant squeaky clean. Always! I remember, a capful of the liquid would be added to a bucket of water, while mopping, to kill the germs. As a child I’d love to see the golden-yellow liquid turn opaque as it touched the water. One swirl and the milky white Dettol water was ready to protect our house. Easy and effective. When my baby sister arrived, her cloth nappies were made bacteria-free by Dettol. The tradition continued when my daughter was born, even though we had graduated to diapers. Yet, Dettol was a constant companion to ensure she was protected from the germs I could not see. For generations, the green logo with a white sword has been synonymous with sanitation, hygiene and protection against microorganisms. Yes, Dettol is a brand that has earned that trust, rightfully. 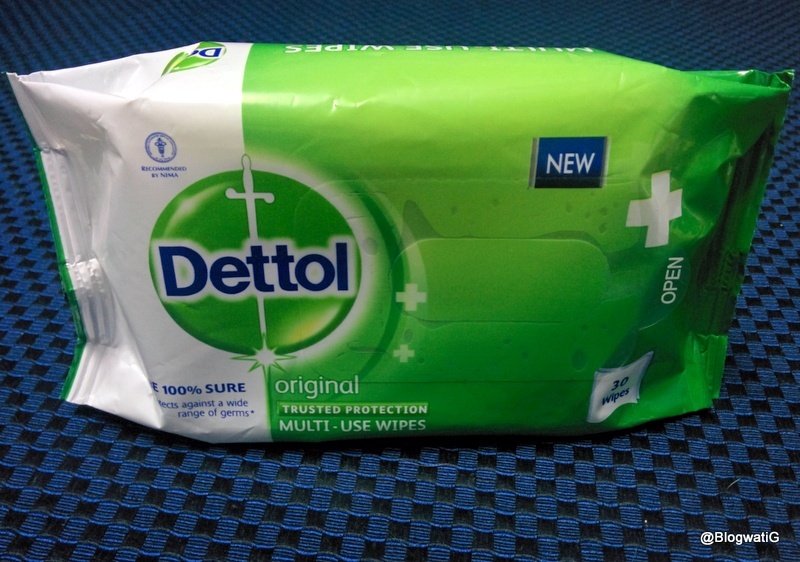 Dettol has recently launched their new range of antibacterial multi-use wipes. Honestly, I felt they were late to the party since there are quite a few brands out there. Wipes were, well, wipes. I’ve never added a second thought to the ones I have used before. You use and throw them, right? Well, so I thought, till I focused on the ‘Multi Use’ bit. Multi Use Wipes, need I say more? I can use them to shine my face and my home. Obviously, not the same wipe. But on a serious note, how much time, space and energy-saving is that? One product for all your hygienic needs. Genius. Alcohol free and PH neutral, these soft wipes are manna from heaven, particularly in the sweltering heat of Mumbai. Yes, even in December! The sweat and grime almost run an ecosystem on our faces, I tell you. And that feeling of being squeaky clean in a jiffy, priceless. The package re-seals every single time, keeping the much-needed moisture for the wet wipes intact. This is a problem I’ve had with a few brands I’ve used earlier. By the time I am to the last 10 wipes, they vegetate to coarse dusters. The wipes are not laden with aroma to give you a headache. A light fragrance that originates from Chloroxylenol is tantamount to brand Dettol. I’d like them to come up with variations in this though. Something citrusy, perhaps? Public spaces don’t scare me anymore. What with my allergies that flare up in a second, I need to be extra cautious, all the time. A swipe of the Dettol Multi Use wipe, and I don’t feel threatened by public washrooms, doorknobs, faucets, and food court tables. Alleluia! Just the other day I had a nasty fall. I scraped my knee, like I would have in kindergarten. Blame it on the uneven roads. I obviously don’t carry a first aid kit, and I was unlikely to find clean water in the middle of a crowded street. A crowd gathered, but they had no solutions. As I rummaged my handbag to find a kerchief to wipe my bleeding knee, I found the pack of Dettol Multi Use Wipes. Instinctively, I used my first wet wipe to clean and hold the wound, albeit temporarily, till I could reach home. Gentle, and safe, I knew I had TRUSTED PROTECTION. Dettol Multi Use Wipes. You never know when you might need one. Get yours here, today.